SPRINGFIELD – State Senator Don Harmon (D-Oak Park) voted today to approve a bipartisan, balanced budget. The budget is balanced through a combination of spending cuts and pension reform. It restores funding to vital human service programs and fully funds K-12 and higher education. Included in the budget is $350 million in new funding for public schools, in line with the new education funding formula passed last year, as well as $50 million for early childhood education. The plan also rolls back Gov. Bruce Rauner’s 10 percent cut to the Local Government Distributive Fund, resulting in approximately $120 million more for municipalities. Funding is restored to human services programs, including: community mental health centers, youth employment services, addiction treatment and prevention services and the Child Care Assistance Program. The budget package now moves to the House for final approval before heading to the governor’s desk. Senate Bill 337 contains provisions to better record and track private gun sales. It treats all firearm licensees the same, regardless of their size. It requires the Illinois State Police, rather than the state agency that regulates professions and occupations, to certify gun dealers. Senate Bill 337 passed both the House and the Senate on a bipartisan vote and heads to the governor’s desk for consideration. 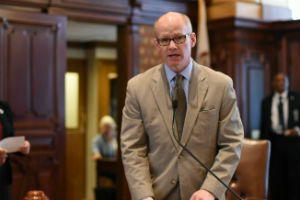 SPRINGFIELD – Senator Don Harmon (D-Oak Park) announced $45,000 in new funding to remodel and renovate the Elmwood Park Public Library’s public service area. 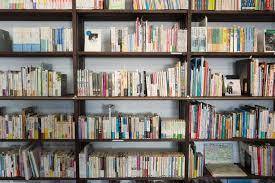 Elmwood Park’s library is one of 15 statewide to be awarded a Live and Learn Construction grant. Secretary of State and State Librarian Jesse White has awarded $724,424 in grants this year to help pay for essential capital improvements. Information concerning the Illinois State Library’s Live and Learn Construction grant program can be found at http://www.cyberdriveillinois.com/departments/library/grants/livelearn_construction.html. 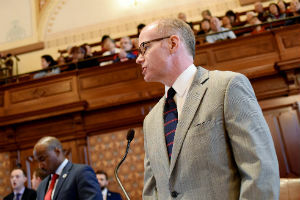 SPRINGFIELD – The Illinois Senate today approved a bipartisan initiative to regulate gun dealers and reduce the number of illegal guns being used to commit crimes in the state. 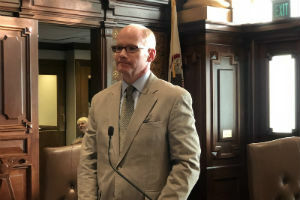 Senate Bill 337 is sponsored by State Senator Don Harmon (D-Oak Park) and builds on a similar measure he sponsored that Gov. Bruce Rauner vetoed March 13. Lawmakers were unable to override the veto despite urging from Chicago Cardinal Blase Cupich, medical professionals who treat gunshot victims and others. 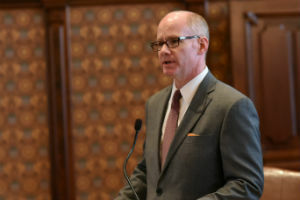 “We are back with a much better bill that addresses the governor’s concerns about small businesses, but we are doing so without compromising public safety,” Harmon said. To crack down on illegal transfers after a gun purchase, it establishes a penalty for those who fail to maintain a record of private gun sales and requires the state police to make key information about guns used in crimes available to the public. Senate Bill 337 was approved 35-18 and will be sent to the House for consideration.